Squash House Quilts: My Dream Come True! One of the things I really wanted to do when I retired was to test patterns for designers. I first heard of "stunt sewing" over at Pam Kitty Morning. Pam has been testing Alex Anderson's patterns for many years. This sounded right up my alley! Not only do I love to sew, but I also pride myself in accuracy and detail. Who better to be a "stunt sewer"? But how would I break into this industry, I asked myself. I don't know any well known designers, let alone anyone else who designs. My dream came true thanks to blogging! I met Stephanie of Loft Creations and as we became closer, she asked me if I'd like to be one of her Supreme Pattern Testers! Oh, yes! I nearly cried! How excited I was! In fact, I'm still excited! Every time Stephanie sends me one of her new patterns, my heart skips a beat. As long as I follow Stephanie's pattern directions to a "T", I can be as creative as I want with my fabric choices. If I find any errors or corrections that need to be made, I make a notation on the directions. This way, when the patterns go to print, they are correct! The best part is I love Stephanie's designs. She creates a quilt or a bag that's fun, easy, has a little whimsy, and often tells a story! I've had so much fun with this "job" and hope to be doing it for a long time to come! Today Stephanie is starting her Sunday with the Supremes series. She is interviewing all of her Supremes and today is my interview. Hop on over and see what I had to say! Great interview - and I love the pictures! Your yard is just so beautiful and park like - you guys should be in Sunset Magazine! I also loved your Barefoot In The Park quilt - could you let me know the pattern name/maker? I'm sure you are an awesome tester! Doesn't it feel great to do what you love to do?! I am going to go check out the interview now. Happy Sunday! Congrats on having a dream come true. I'm off to read the interview now. I love it when a Dream comes true!! I am sure you are a perfect match for her needs. That's great! I did not know you always desired to be a stunt sewist! I agree, Stephanie's designs always include a quirk of whimsy and fun but sensible directions that are not too complex. It is always nice when the MATH is done for one! Well, that was fun to read! Congrats on your celebrity!! It was fun to read your answers, and there were such nice pictures of you and Squash House. Stephanie's patterns are so reliable and her instructions are clear! I didn't know that about you. I am off to read more. The pantsuit thing was too funny. I remember when my mom's employer began allowing women to wear pants to work. It was SUCH folderol - the slacks had to hit the heel of the shoe in just a certain spot, the length of the jacket or tunic needed to cover a certain amount of the hips. I was a great interview Candace! Thank you for sharing about you. I enjoyed looking at the pictures. They are beautiful! Fabulous interview! Your front yard is gorgeous. I see why you love it so much. 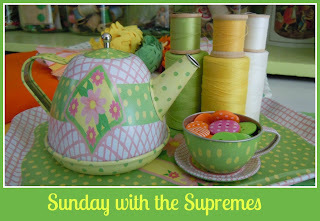 Stephanie's patterns are wonderful and so easy to follow thanks to test pilots like you. I have been appalled by the number of mistakes some very big names make in their instructions. They would be enough to put a novice off. Stephanie's patterns on the other hand are great as they have numbered instructions which make them easy to just do a step of in your spare time; have lots of diagrams so you can see you have done things right; and are a joy to make and well as use.